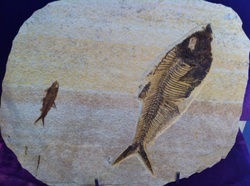 At Arcane Artifacts we have a magnificent range of real fossils from all over the world. an interesting story of the Earth and its days gone by. Partial Oviraptor claw, Pachycephalosaurus vertebra, skull spikes and toe digit, Parasaurolophus pathelogical vertebra, toe digit and tooth, Ankylosaurus skutes and juvenille pelvic piece and much more. We also have a cool range of Megalodon shark teeth, Spinosaurus teeth, Carcharodontosaurus teeth, Trilobites, Wyoming fish fossils and Dinosaur Poo (for the person who has everything), and the Big Bang Fossil bag - a bag that has 10 different types of fossils, with labels and timeline, perfect for young children. We also have small Orthoceras and Ammonites that start at only $3.00 - $5.00 for the kids or young budding paleoentologists. Come on down and check us out. Where customer service and value for money is not extinct!